The severity of infection can vary in some hives from a few cells per frame to 90% of the brood. The number of colonies infected in an apiary may range from 0 to 100%. The level of infection has declined since it was first detected and the disease no longer causes an economic impact on the industry. Sacbrood can occasionally be found at very low levels and only manifests itself when bees are under stress. Some research workers thought that sacbrood virus, in combination with bacteria, caused European foulbrood disease. However, in 1912 it was shown that sacbrood virus was not associated with European foulbrood disease. Because of similarities in appearance between sacbrood disease, European foulbrood disease and American foulbrood disease, it is necessary for beekeepers to recognise the different signs of these diseases. Sacbrood disease is caused by a virus. The virus is common in hives but only causes disease in bees that are genetically susceptible. The appearance of the disease in early spring may be due to poor detection and removal of diseased larvae by nurse bees. This is caused by an increased larva to adult ratio; however, as the colony expands and develops sufficient strength, the nurse bees are able to cope with the disease. Sacbrood disease can become apparent after bees are stressed by beekeeping management practices such as re-queening or moving hives. Because sacbrood disease is caused by a virus, there is no method of treating affected bees. Re-queening hives showing persistent or severe signs of the disease is recommended. New queens should come from hives that show resistance to the disease. Avoid the introduction of bees and equipment from unknown sources. Avoid exposing honey combs or equipment to robbing. Spare equipment may be stored and fumigated away from robber bees. Watch for signs of the disease. Report any brood abnormalities immediately, by telephoning PADIS, free call 1800 084 881. 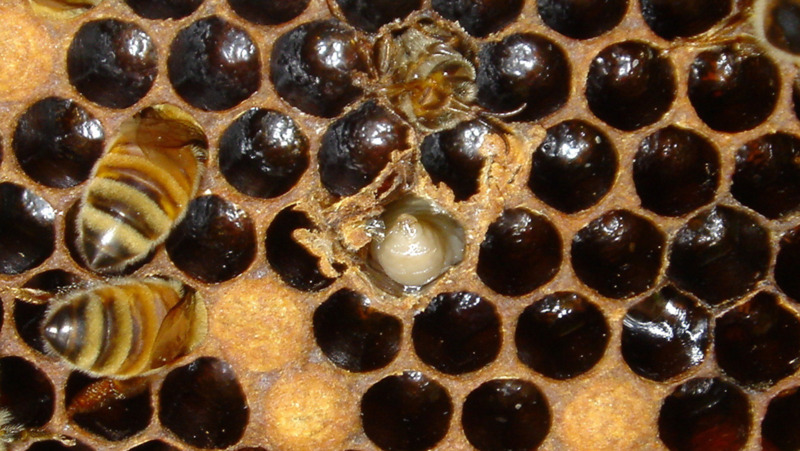 Brood diseases are notifiable and beekeepers are legally required to report them. Submit slide smears and a sample of comb to the Animal Health Laboratories, Department of Agriculture and Food, Western Australia, South Perth. Obtain microscope slides from Animal Health Laboratories, South Perth. Identify the hive from which the samples are taken. Select a piece of affected comb not less than 75mm square. Write your name and hive identification number on a clean microscope slide using a permanent marking pen. Select two larvae showing early signs of the suspected disease. Place one at each end of the slide. Mash the larvae thoroughly using a clean match for each larva. Remove the bulk of the larval remains from each mashed larva, leaving a separate patch of milky liquid (about the size of a 5 cent piece) at each end of the slide. Allow to dry but protect from the sun at all times. Submit five slides for diagnosis, each containing two larvae. Please note, some costs may be incurred.